It was cold and the skies were threatening to rain. Yes, the 2nd day into Summer and it looked more like Fall. That is what we get in Vancouver. Funny how the day before, it was warm and muggy. Hence, my visit to Kim Hoang would be perplexing to some. You know, hot noodle soup + muggy day = lots of sweat. But hey, everyday is a good day for Pho right? What do they do in Vietnam when it is consistently warm? Anyways, I was on my way to pick up some take-out food at Afghan Bakery when I spied with my little right eye (because it was on my right hand side! 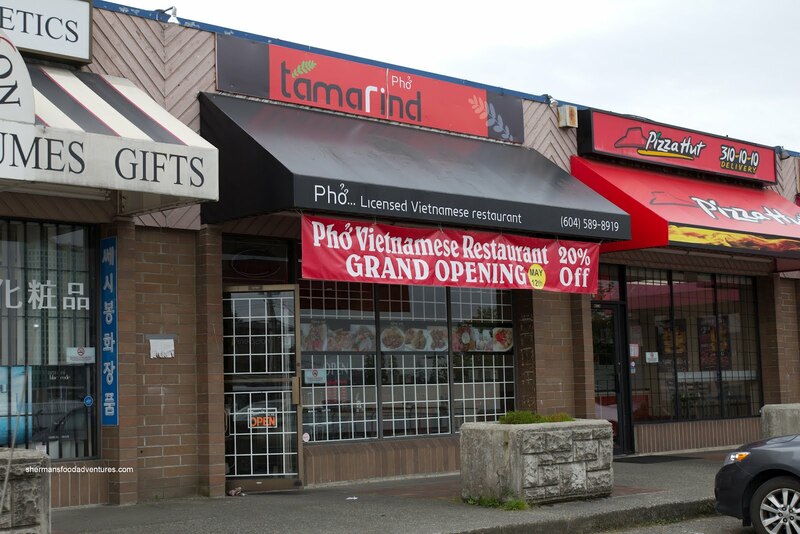 ), a new Vietnamese joint in the same complex. Tamarind eh? Name sounded like a Thai restaurant. I got out of my car to investigate. To my surprise, it was a Vietnamese restaurant. Pho again? For the second straight day? Well, at least it was cooler. Talk about stumbling upon something new, the place had just opened recently with a 20% grand opening special. The ladies inside greeted me warmly and anxiously. 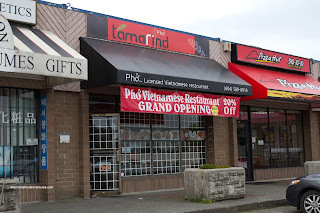 One of them declared that they are even better than Pho Tam. *Gasp* That is quite the proclamatio n! So I settled in and ordered 2 full-sized dishes to her surprise. Hey, I was hungry! I started with the Pho Dac Biet which arrived in only one size. That was fine with me since I find it silly with the large and small designations because at most places, there seems to be very little difference between the two. I immediately took a quite sample of the soup. 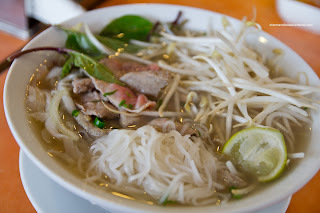 It was definitely lighter than Pho Tam, yet still exhibiting definite flavours. It was clear and overall pretty good. Was it better than Pho Tam? Well, that would be subjective wouldn't it? For me, it was different. As for the noodles, they were chewy and didn't clump up. The meats were mostly tender, but the flank was a touch dry. 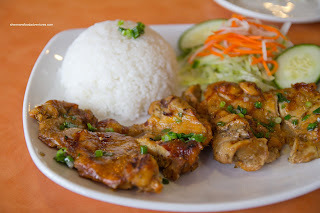 For my second dish, I had the Lemongrass Chicken with broken rice. Now this plate of food rivaled Pho Tam in terms of size and quality. There were 2 de-boned chicken legs which were cooked perfectly tender and moist. There was ample seasoning including a good hit of lemongrass. The rice was cooked nicely too, where it was fluffy with a bite. I really liked this dish. In fact, the items that I did try were above-average and the ladies there truly care about their customers. I will definitely return. Ooh, my neck of the woods. Might have to check this out on one of those days when Pho Tam has a line out the door! 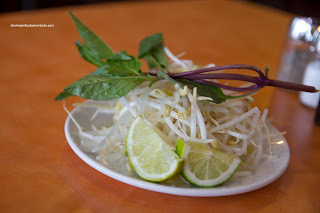 @mbsunshine Yes, Tamarind is a good option, but Pho Tam still rules!